U.S presidential nominee U.S. Sen. John McCain (R-AZ) (2nd R) joins Republican U.S vice-presidential nominee Alaska Gov. Sarah Palin and her family, daughter Piper (3rd R), Willow ( 4th R), husband Todd (center back), Bristol (2nd L) and her boyfriend Levi Johnston, and Track Palin (L) Republican Gov. Sarah Palin stand on stage during day three of the Republican National Convention (RNC) at the Xcel Energy Center on September 3, 2008 in St. Paul, Minnesota. 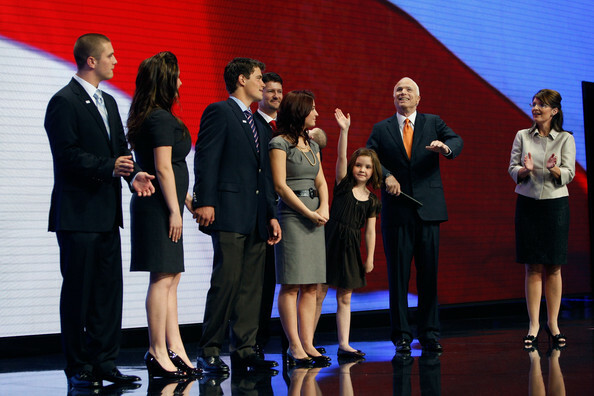 U.S. Sen. John McCain (R-AZ) will accept The GOP nomination for U.S. President Thursday night.